Jannette Porter is celebrating 30 years of membership in Trakkers. In an interview last week, she shared some reflections of her time in the club. When and why did you join Trakkers? Jannette confides that she never thought of herself as an athlete, but when she tried cross- country skiing, it felt natural and right. She began skiing as member of a different club, but after being invited to join a Trakkers trip, and having such a great time on it, she switched to Trakkers in 1979. During her early years as a Trakkers member, she used the club’s free ski lessons to improve her technique and courage to tackle big hills. Except for several years when she lived away from Toronto, this dedicated club member has never looked back. In what ways have you benefited from being a member? In addition to the fitness and social benefits, Jannette says the club provided her a place to develop leadership skills and confidence. She reports that when she was nominated for club President, she was so flabbergasted she didn’t protest and it was only when she received the materials from her predecessor that she realized how big an opportunity (and challenge) she had taken on! The experience was so rewarding, she accepted the President role again, years later. Club executive roles such as Membership Director and Publicity Director also helped her learn and grow her leadership abilities and friendships in the club. Many Trakkers members don’t know that the club was started under the auspices of the YMCA. During her first term as President, Jannette shepherded the club’s transition to an independent non-profit organization. What are some highlights of your early and more recent experiences as a member? Longer trips and off-season activities have been especially memorable. Kayaking around Toronto Islands and paddling down the Don River with fellow Trakkers were fun too. Jannette helps run the popular Trakkers Spokes and Spiggots Winery Bike Tour. She recalls a Year-End Party where Earth Hour was observed with candles and time for contemplation. It is always a pleasure to re-connect with ski friends and meet new cross-county skiing enthusiasts every November at the annual Club Open House. What are some things you like about the club now? Jannette likes the family-friendly orientation of the club and new destinations that have been added to the list of resorts we travel to, especially Arrowhead and Kawartha. Most of all, Jannette loves the quiet peace of being outside in a winter wonderland on her skis enjoying the austere beauty of fresh snow hanging on tree branches under a brilliant, cloudless sky. Gliding along groomed, double tracked trails in conversation with a fellow member is a special pleasure. This entry was posted in Trakker Profiles on October 23, 2015 by trakkers. It’s ski swap and Snowfest season! We’ve got all the details for cross-country swaps and winter gear kick-offs below. We’ve also got a call-out for any returning or new bus captains to support our Sunday Trips! Mountain Equipment Co-Op (MEC) holds their annual Snowfest on Saturday, November 7 — and Trakkers will be there! We’ll have a booth set up and volunteers on-hand to answer any questions about skiing, the club and our Sunday Trips. MEC will be holding their annual Snow Swap from 11:00 a.m. – 1:00 p.m., and they also kick off their weekly cross-country ski waxing clinics on that day. The club is looking for a few more volunteers to help us staff the table. If you’re interested in helping out for an hour or two, please email Han Zhang, our Publicity Coordinator. Want to meet more people in the club and get a free Sunday bus fare? Why not consider becoming a Trakkers bus captain? Our bus captains are responsible for registering all skiers as they board the bus, purchasing and distributing the club’s trail passes when we arrive at the resort, and acting as all-around ambassadors on each Sunday trip. It’s a lot of fun, the club provides full training, and as an extra incentive, if you volunteer as a captain the cost of your Sunday bus fare is covered by the club. We require two bus captains per bus for each of our Sunday trips. The club is holding our annual Bus Captain training boot camp for all returning and potential new captains on Saturday, December 5. If you are interested in volunteering as a bus captain please contact Sam Tosaria, the club’s Lead Bus Captain, for more details. Returning bus captains, please note that the training is mandatory, as there are new process improvements we’re lining up this year to make the job even easier. Hold the date to come out and reconnect with members in anticipation of the upcoming season or to find out more about the club! Light refreshments will be served and we’ll have some wonderful door prizes! Friday, November 20, 7:00 – 9:00 p.m.
Wednesday, October 21, 6:00 p.m .
No need to reserve in advance for the pub night, just show up. Think You Could Be An Instructor? Trakkers members consistently tell us that free lessons by instructors certified by the Canadian Alliance of Nordic Ski Instructors (CANSI) are a big drawing card for new and returning members and we continue to do active promotion to expand the number of our instructors. This year the club will have 6 instructors, but we’re always on the look out for others who want to become certified, or to be assistant instructors, in order to keep pace with the demand for lessons. If you’re interested in improving your skiing and giving something back to the club, this can be a great way to do both! Dates for CANSI’s prep and certification courses have yet to be announced (they will likely take place in December or January). You don’t need to know how to do both skate and classic ski techniques as CANSI offers certification for classic instruction only as well. For anyone who completes the Level I training and commits to teach with Trakkers for a period of time, the club reimburses the costs of the CANSI training and certification, and covers trail/bus fees while teaching as an incentive. If you’re interested, please email Steve Favell, our Ski School Coordinator. The club is always on the look out for potential new Sunday trip destinations. Have you recently visited a park of resort that advertised cross-country skiing and think we should check it out? If so, Katja Lutte, our Sunday Trips Coordinator, would like to hear from you. The club’s 2014-15 year-end financial statement is now posted in the Club Operations section of the web site. Trakkers fiscal year ends on May 31st. To view the club’s year-end statement simply log in to your member account and click on “Club Operations” on the left-hand navigation bar. Any questions about the statement can be directed to Christina Macintyre, the club’s Treasurer. Keep on trakkin! And don’t forget to follow us on Facebook and Twitter for the latest updates! 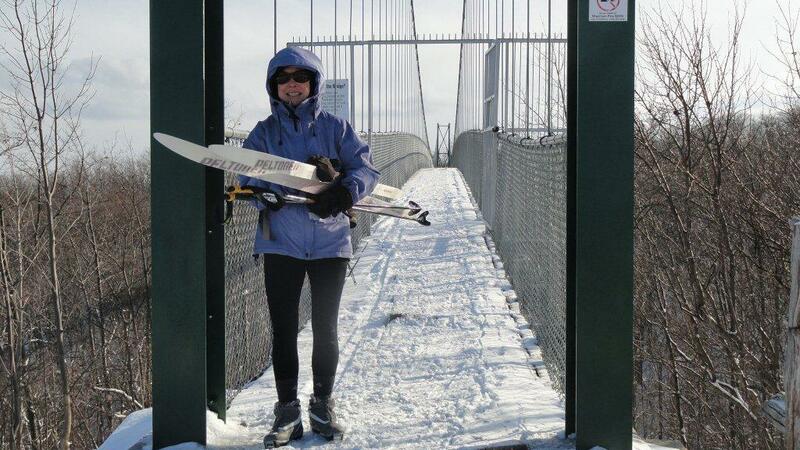 This entry was posted in President's Blogs and tagged cross-country skiing, winter on October 13, 2015 by trakkers.